Abq Jew ® Blog: Remember Me? Holocaust Museum Tells Orphans' Stories: Tonight's CBS Evening News ended with a touching piece, Holocaust Museum Tells Orphans' Stories. The United States Holocaust Memorial Museum project "Remember Me?" is poring over portraits of orphaned children displaced by Nazi persecution in hopes of telling their stories and reuniting them with surviving families. This photograph of Salomon Goldberg was taken in December 1945 at the home for Jewish children at Wezembeek, during the second of his two stays there. Salomon was born in Belgium to a Jewish family that had emigrated from Poland. They lived in Antwerp, where Salomon’s father had a butcher shop. Salomon and his older brother, Michel, were the youngest of the family’s four boys. In October 1940, after the first German ordinances regarding the Jews were issued in Belgium, the butcher shop closed its doors. 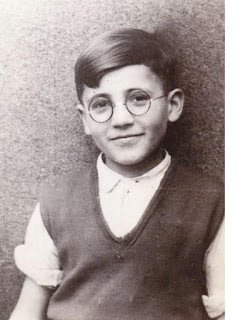 Less than two years later, in August and September 1942, Salomon’s oldest brother, Henri, aged 19, and his parents were deported one at a time. That marked the beginning of Salomon and Michel’s life in the children’s homes, which lasted for two and a half years for Michel and another two years for Salomon after their father returned from the deportation. He was one of the rare survivors of the 1942 deportations. Salomon twice avoided deportation after being taken during a roundup. The first such escape took place in September 1942. The family had already avoided capture during a raid on their neighborhood on August 15, 1942. On September 12, 1942, the eve of Rosh Hashanah, Salomon and his parents were captured and taken to prison en route to the transit camp Malines (Mechelen). Thanks to his father’s efforts, Salomon, who was ill, and his mother were freed with a group of Jews who were eligible to be released because they were of Belgian nationality. His mother then found a non-Jewish friend to take Salomon and his brothers Michel and Adolphe to hide with her younger sister in Brussels. Their mother was taken in early October 1942, and they never saw her again. The children were admitted to the home in Wezembeek because they were under 16 years old and had been left alone after their parents were deported. According to Salmon’s brother Michel, the Jewish children who met those criteria were classified as “Alleinstehendekinder” (solitary children). The home was administered by the Jüdische Vereinigung, or the Association of Jews in Belgium (AJB), which was created in 1941 to administer the segregation of Jews and “promote” emigration. In October 1942, Salomon evaded deportation for the second time. On October 30, the SS burst into the children’s home. The children and staff were put in a truck and taken to Malines. They were to leave on the 16th transport, which was due to depart very soon. However, due to an escape by other prisoners who were to be deported, the train was delayed by six hours. This six-hour delay was welcomed and allowed discussions between the AJB and the authorities on which it depended. The discussions concluded during the night. Not only were the children freed and sent back to the children’s home, but they also managed to save six younger children, who had been brought to Malines from a nursery, by smuggling them out under their capes. That same night, the Nazis raided the Jewish section of a hospital in order to fill the train that was about to leave. Later, in April 1943, Salomon and Michel had to leave Wezembeek. They were given false names and became hidden children in an institution that cared primarily for the children of Belgian prisoners of war. The move was organized jointly by the Jewish underground and the AJB to save the children. Today, Salomon and his wife, Betty, live in Brussels. They have a son, Olivier, and a grandchild, Arnaud. Salomon is retired from a career with multinational chemical companies.